*Warning: Some people may find some of the images included in this article confronting or distressing. Having lived in Australia for most of my life, I’ve never really been exposed to death. I’ve never even been to a funeral. Despite this, I’ve always harboured a small fascination with the afterlife and the rituals that accompany a religious approach to death. For this reason, I was excited about going to the Crematoria. I know it sounds morbid, but the whole idea of traveling is to experience new things. Make no mistake, I was conscious of the inevitable air of solemnity that would surround such a place, and before getting in the taxi to the temple, Jo and I prepared ourselves mentally for what was sure to be a confronting and bizarre encounter. Jo and I arrived at the entrance to Pashupatinath inadvertently on the first day of Mahashivaratri, a Hindu festival that draws around 700,000 religious devotees from all over Nepal and India. We walked past the many market stalls selling gold trinkets to be offered to the various Hindu gods and were greeted by a very smiley Nepalese man. He showed us where to buy tickets and then beckoned us through the entrance of the temple. Without any delay, we were taken straight to a vantage point behind the crematoria platforms. A young man clothed completely in white was stoking the flames underneath a pile of wood and hay. Within 5 minutes of entering the temple, we were witnessing our first cremation. Our guide informed us that the young man was creating his father, and he would continue the grieving period for the next year by wearing only white. The young man cremating his father. Much to my surprise, the son did not seem to be upset. He was burning the remains of his father and it seemed to have very little emotional influence on him. I was impressed with his stoicism. I knew that if I was in his situation, I would be a blubbering mess. The air of solemnity that I had expected seemed to be non-existent. In fact, the whole process was much more methodical than melancholic. That being said, we had arrived rather late in the cremation process. We could not make out any semblance of a human body amongst the flames, albeit, I didn’t look too hard. I took this picture from across the river bank. At the time, I could not see the body on the pyre and assumed that the men were merely preparing for the cremation. It was only when I uploaded the photo’s to my computer that I realised what I had photographed. Throughout all of this our guide, despite no mention of a fee, had been narrating the entire process as well as pointing out the significance of the various statues and our surroundings. It started to feel more and more like a personal tour, which meant that it probably wasn’t free… To be sure, I asked him. 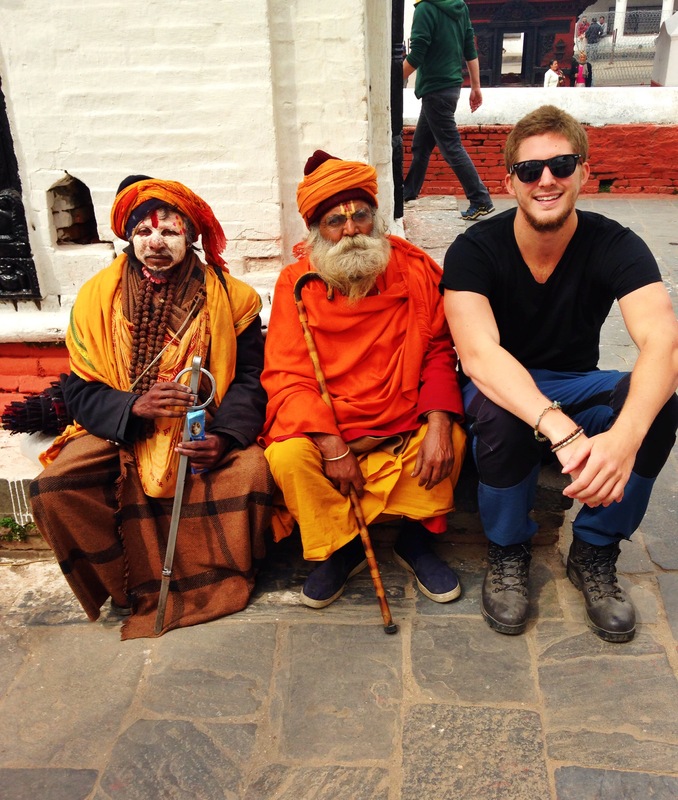 Posing with some fake Sadhu’s. They dressed as holy men and took pictures in exchange for a few Rupees. Our guide was not overly fond of them. The cremation platforms are set alongside a small river. The water is murky and not what I would call an adequate resting place for a loved ones remains. 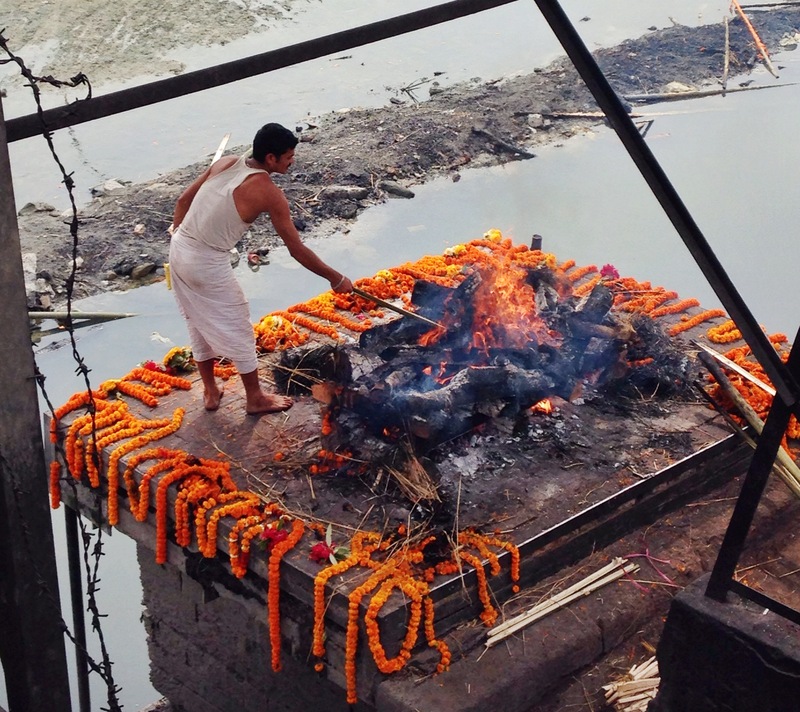 Nevertheless, once the body is burnt, the ashes are rather unceremoniously swept off the platform and straight into the river. Different sections of the river are reserved for different classes, with one platform only being used for people of high stature and intelligence. In this more privileged area, there was a boy who, every day, will trudge through the remains of hundreds of people collecting coins with a magnet on a string. The young boy collecting coins amongst the ashes in the river. 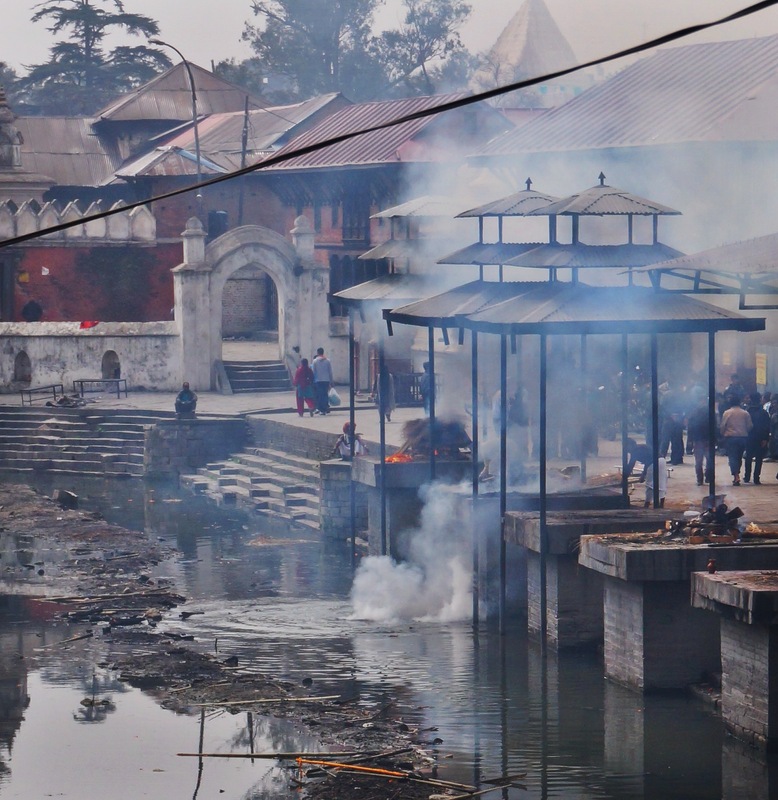 Ashes being swept into the river. Throughout the tour, Jo and I had been uncomfortably aware of the religious significance that such a place held. We were especially cautious when taking photographs, not once snapping a picture without the approval of our guide. Our awareness was only heightened when we entered the room of the Sadhu’s. Sadhu’s are Hindu holy men who through a lifetime of self-sacrifice and abstention hope to achieve “liberation”. At least, that’s what Wikipedia says. Anyway… Our guide had been describing the reverence and holiness of the Sadhu’s throughout the tour, so when we walked through a doorway and into an open area filled with about fifty of the holy men, we were terrified of committing any religious faux pas. Unfortunately, this was literally the first thing I did. 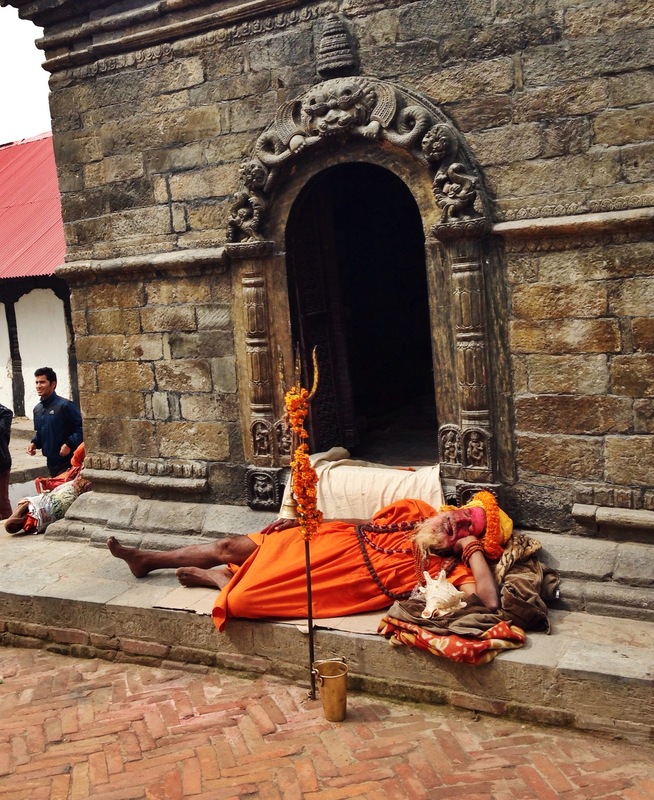 I stepped through the doorway and, without thinking, took a picture of a sleeping Sadhu. The man who had tapped me on the arm was absolutely terrifying. He had a harsh, angry face, and his mouth and nose were covered in festering pustules. He had a singular tooth protruding above his bottom lip and long, dirty, dreadlocked hair. He had a deep, crackling voice and was dressed as a Sadhu. But by far the most unsettling thing about this man was his eyes. They were milky white, weeping, and scarred. I know it sounds awful because this man was in such terrible condition, but I honestly could not have dreamt of a more startling face. 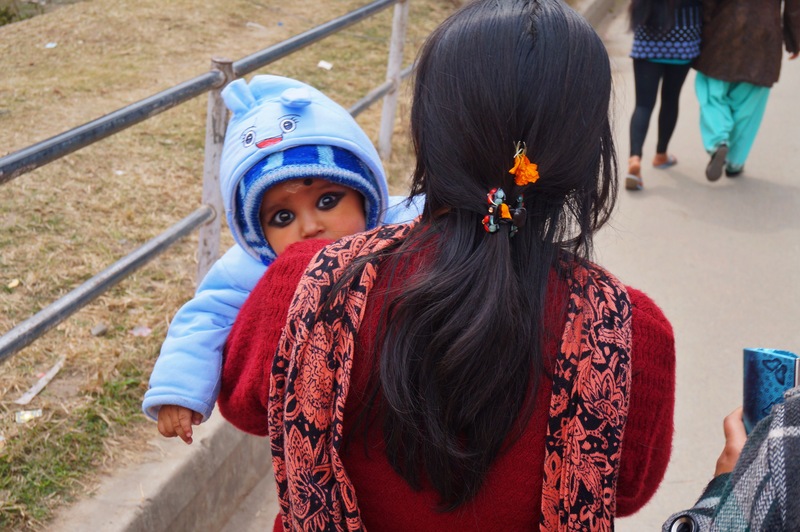 He started speaking to me harshly in Nepalese. Obviously I did not understand, and after repeated attempts to communicate with me, he began raising his voice and pushing me. I’m not great with confrontation normally, let alone when I’m being shoved and yelled at by a holy man in a language that I don’t understand, in a country that I’ve only been in for two weeks, whilst visiting a temple of huge religious significance, while also in the company of fifty or so Sadhu’s. That being said, I did what I always do. I tried to ignore it. I turned around and the Sadhu grabbed my arm in an attempt to pull me towards him. At this point, a large crowd of Nepali men had started to gather around us as the situation escalated. Just as this was happening, our guide, who had been in conversation with another man, noticed what was going on and jumped in between me and the increasingly irate Sadhu. The argument continued between our guide and the holy man, who was motioning for me to give him money. Eventually, our guide persuaded the Sadhu to leave us alone. He walked away, still pointing and shouting angrily at me. I was visibly shaken up by what had just transpired, and my guide obviously noticed, because he assured me that he would “protect” us. I assured him that he was the best 1000 rupees I’d ever spent. I was still in a small state of shock for a good hour after we left the Sadhu’s area. After the angry holy man left us alone though, everyone else was quite nice to us. 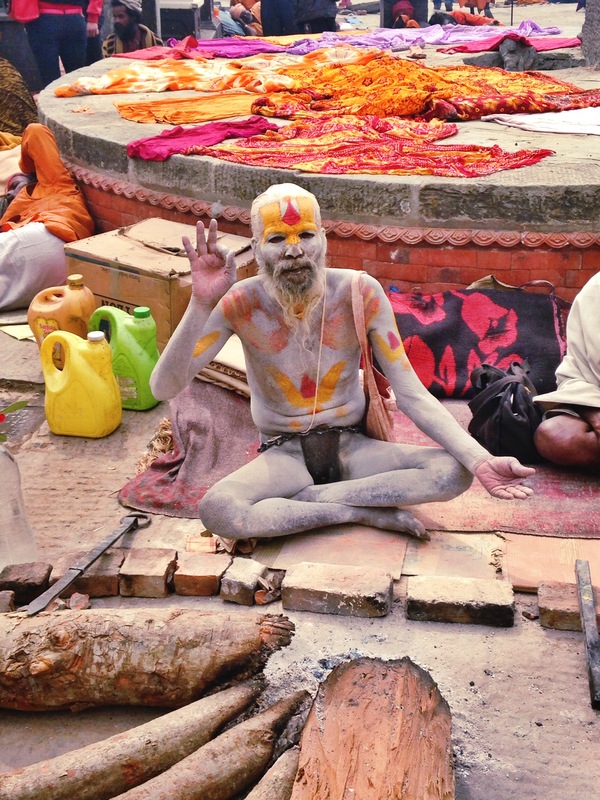 We witnessed Sadhu’s reading scripture, rolling joints, and lazing about. Apparently Marijuana is only legal in Nepal during the Mahashivaratri festival, and it seemed like everyone was taking full advantage of this. Our guide took us around a few more small shrines and finished off the tour by taking us through the “old people home” by the river. Having a good nap, living the Sadhu life. Only elderly men and women reside in this area, doing laundry all day, chatting to each other, and generally lounging about. 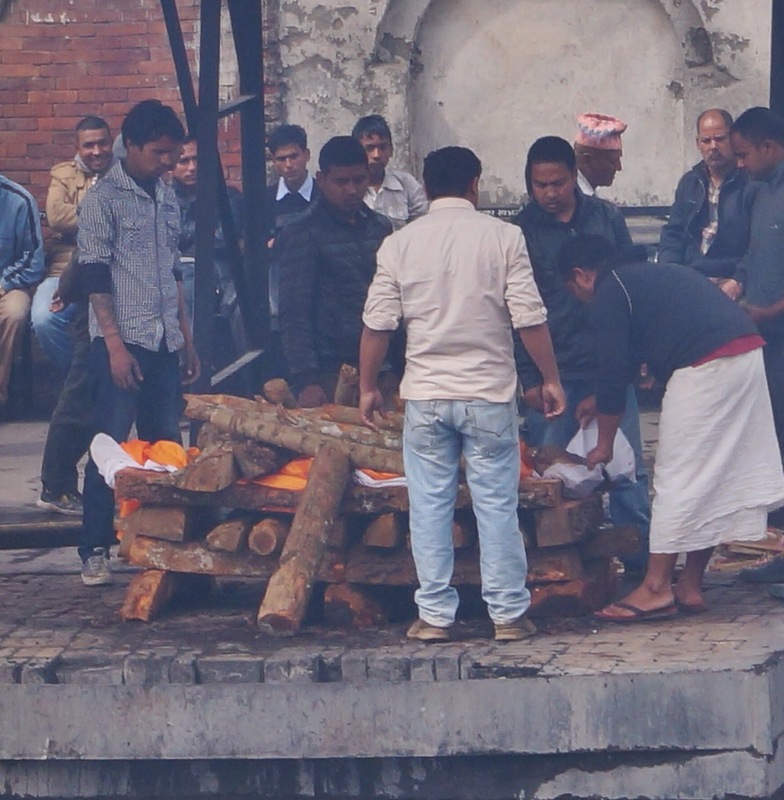 After a few minutes, the morbidity of keeping a group of old Nepali men and women in a building that’s directly behind the crematoria dawned on me. You could even see plumes of smoke from the cremations from inside the building. However foreign this seemed to me, it’s perfectly in line with Hindu tradition, which requires cremation to be completed within 24 hours of death. It is also considered to be good luck to die by a river. Still, knowing that all of these people faced their own mortality and had decided to wait out their demise was difficult to swallow. 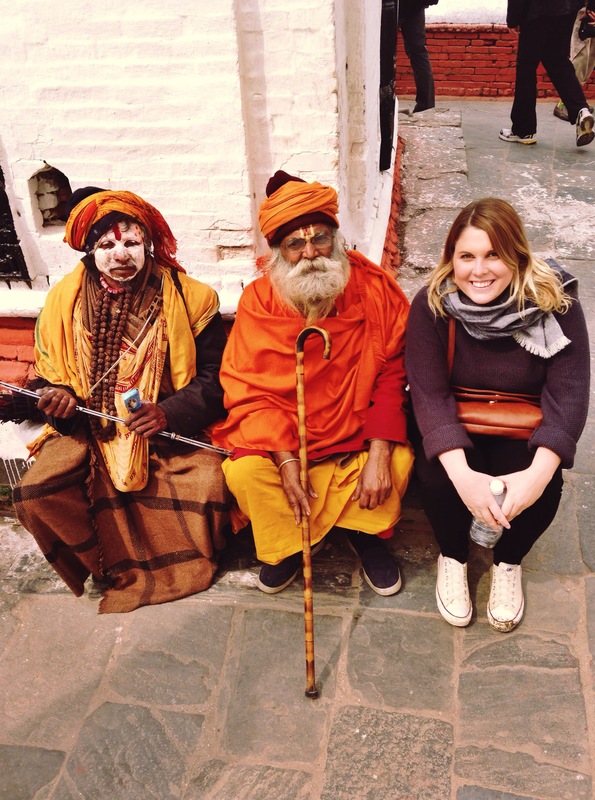 That’s how I would describe my experience at Pashupatinath. Difficult to swallow… It was the first time that I can ever remember feeling culture shock, although I’m sure some of that was just the aftermath of my encounter with the angry Sadhu. Everything about that place was foreign to me, not just the rituals and the setting, but also the attitudes towards mortality and the human soul. Once the soul has disembarked on it’s journey to the afterlife, the body is disposed of, it’s purpose having been served. There is no grace in being swept into an almost stagnant, murky stream, but that is of no consequence to a persons spirituality. 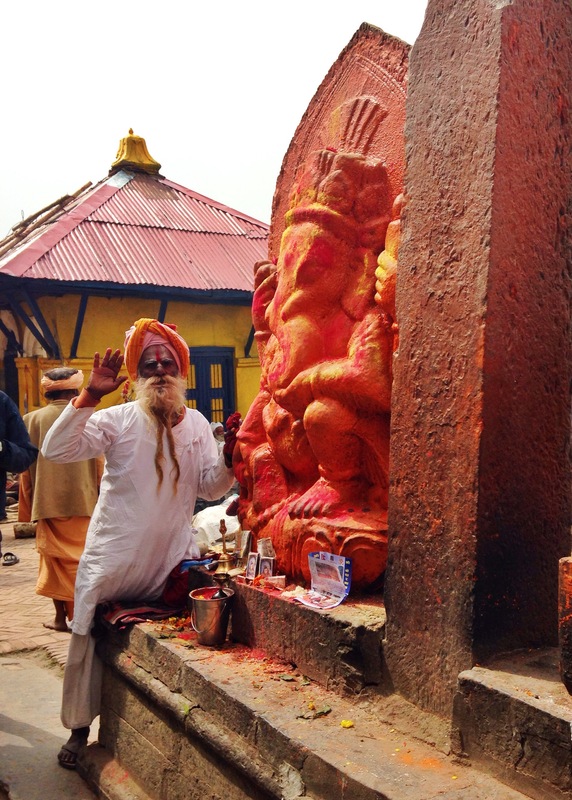 The soul is intangible, the body merely a vessel, and nowhere else in Nepal is that more obvious than at Pashupatinath. It really was an incredible experience, i’d recommend it to anyone. You’re spot on with the cycle of life; it’s obvious in the preparation of the body for the afterlife. I just wish that I’d known more about the rituals before I went so that I could’ve better understood what was being done. Thankfully, our guide was very informative, and we rarely had to ask questions. Very cool post, and the photos were incredible! Sounds like there is an opportunity for a highly commercialized Sadhu Fighting League. Just an addition. 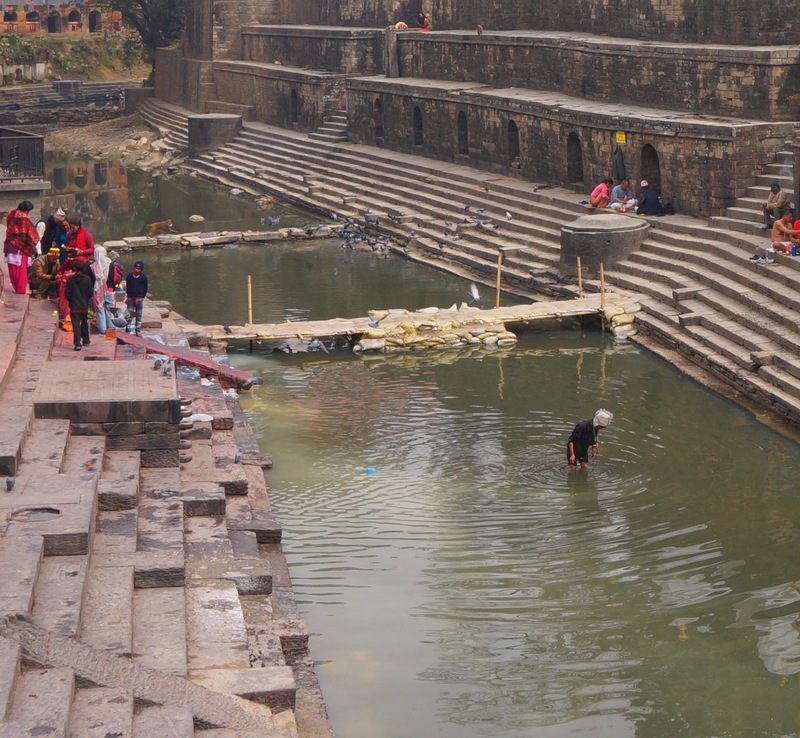 Pashupatinath is the only Hindu temple of Lord Shiva, where after death rituals is carried out. Yikes, that’s crazy about the mean sadhu! I loved seeing them in Varanasi, but I couldn’t bear to watch the cremations. They burn 3 or 4 at a time and I watched maybe 10 minutes but by then I was covered in human ash and needed to get some fresh air. It was surreal. Yeah, it was pretty confronting. The Sadhu’s had lit fires all over the place as well so the air was really difficult to breathe. It was an extreme sensory overload. Wow this is crazy, I didn’t even know you could go to a crematoria before reading this post. While it’s certainly not glamourous to be swept into the river after you die, it actually sound better to me than being buried in a hole in the ground though! This year shivaratri is on coming tuesday 17 feb.